His lawyer tells the Maine Supreme Court on Wednesday that ballot access for third-party candidates must be protected. PORTLAND — Nine years after Ralph Nader made one of his failed presidential bids, a different administration is in the White House, his running mate is dead and his biggest role in the last election was as moderator of a debate for alternative candidates. Still, he fights for 2004. For four years, the consumer advocate and Green Party candidate has been accusing Democratic operatives of using illegal and malicious tactics against him in that campaign. The lawsuit has been winding through the courts since and appears to be far from a resolution. Lawyers in the case made their second appearance in less than two years before the Maine Supreme Judicial Court on Wednesday, reduced to the same arguments they were making two years ago, thanks to various rulings and a new legal standard the case created. 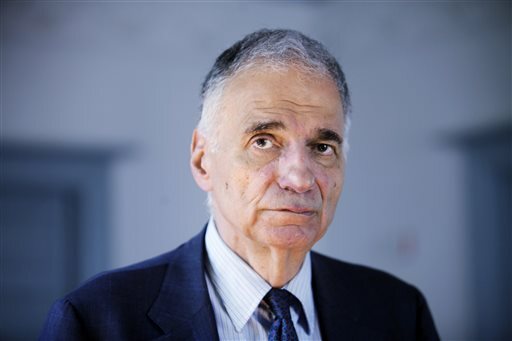 With the election long over, and another losing bid for the presidency in 2008 also behind him, what keeps Nader fighting are his principles and an effort to clear his name. It’s important for independent candidates to defend their ballot access rights to ensure more independents in the future can run for office and that politics isn’t dominated by a two-party system, his attorney, Oliver Hall, said following Wednesday’s hearing. Plus, Nader wants the record to show he didn’t do anything wrong in attempting to get on state ballots as a candidate. To that end, Nader sued Kerry-Edwards 2004, the Democratic National Committee, the Maine Democratic Party and other groups in 2009, accusing them of trying to drain his financial resources and keep him off the ballot in Maine and more than a dozen other states in the 2004 election. Many Democrats blamed Nader for siphoning away votes from John Kerry in his loss to President George W. Bush, just as Nader’s showing in Florida in 2000 is blamed as a big factor in Bush’s defeat of Al Gore. Nader and his 2004 running mate, the late Peter Camejo, ultimately appeared on the ballot as independents in 34 states, including Maine, and collected only three-tenths of 1 percent of the nation’s popular vote. On Wednesday, an attorney for the Maine Democratic Party and allied organizations said a lower court judge erred in allowing Nader’s lawsuit to go forward. Hall told the justices the lawsuit should be allowed to continue. The party has said it had a constitutional right to challenge Nader’s efforts to get on the ballot. Nader’s side has said the First Amendment doesn’t allow somebody to make baseless allegations to block a candidate from the ballot. 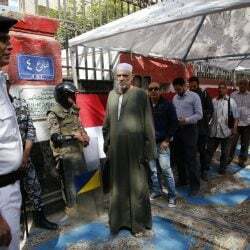 The Nader side claims the Democrats filed 29 complaints in 18 states and Washington, D.C., often accusing the Nader campaign of fraud without any evidence or for innocent, small technical mistakes on petitions.